There are several different dialogs which allow the end user to modify various settings in RadPivotGrid. The dialogs can be opened from the menus in RadPivotGrid or RadPivotFieldList. Each dialog implements a specific interface which will allow you to replace the default dialogs with custom implemented ones. The AggregateOptionsDialog allows the end-user to change the aggregate function of an aggregate description as well as set a custom name for it. This dialog is opened from the Aggregates list in RadPivotFieldList. The AggregateOptionsDialog implements the IAggregateOptionsDialog interface. 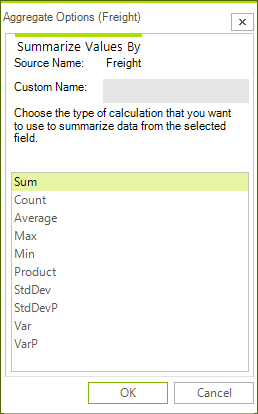 The CalculationOptionsDialog allows the end-user to change the way that values are calculated. There are various calculation options like % Of, Running Totals, Rank, Index, etc. This dialog is opened from the Aggregates list in RadPivotFieldList. The CalculationOptionsDialog implements the ICalculationOptionsDialog interface. The NumberFormatOptionsDialog allows the end-user set a format string for the calculated values. 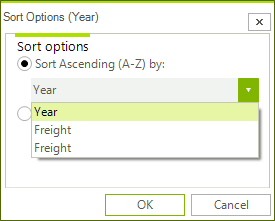 There are several predefined strings in the drop-down and any custom string can be entered in the editor as well. This dialog is opened from the Aggregates list in RadPivotFieldList. The NumberFormatOptionsDialog implements the INumberFormatOptionsDialog interface. The SortOptionsDialog allows the end-user to select order in which the groups generated by a given group descriptor are sorted. They can be sorted alphabetically by their names or ascending/descending by the values of the aggregates for the groups. 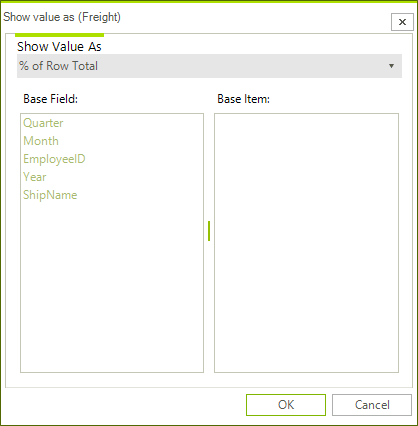 This dialog can be opened either from the RadPivotFieldList or from the drop-down menu of the group descriptors in RadPivotGrid. The SortOptionsDialog implements the ISortOptionsDialog interface. The LabelFilterOptionsDialog allows the end-user to select the filter function applied to the labels of the groups when using Group Filtering or the fields of the items when using Report Filtering. The LabelFilterOptionsDialog implements the ILabelFilterOptionsDialog interface. The ValueFilterOptionsDialog allows the end-user to select the filter function applied to the values of the groups when using values filters. The ValueFilterOptionsDialog implements the IValueFilterOptionsDialog interface. The Top10FilterOptionsDialog allows the end-user to set the Top10 filter applied to the values of the groups when using value filters. The Top10FilterOptionsDialog implements the ITop10FilterOptionsDialog interface.